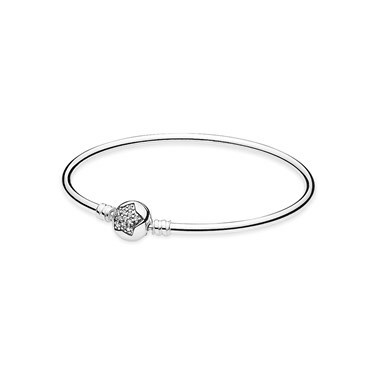 Add a touch of sparkling style to your look with this stunning bangle from PANDORA. Beautifully crafted from sterling silver featuring a charming clasp with a sweet star design embellished with pavé-set cubic zirconia crystals. I am very pleased with my purchase it was well wrapped and a quick delivery I will definitely shop again thank you . Does the clasp have the Pandora logo on the back?